The same is true when it comes to your social media marketing. 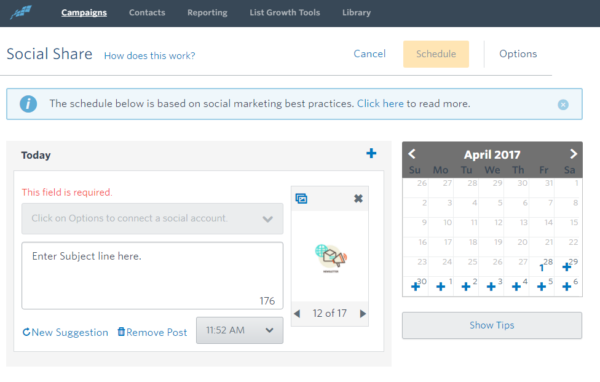 Creating a social media schedule is the best way to stay on top of your social media marketing. Still not using email marketing to increase your social media reach? Start your free 60-day trial today! 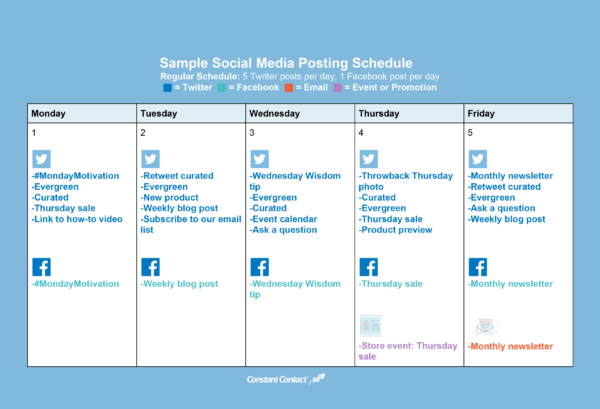 How can you create a social media posting schedule for your business? Use these tips to create a schedule that works for your business. With almost two billion unique monthly users, Facebook is a good starting place for many businesses. Remember, you don’t have to be on every network. Start by building a presence on a couple that are a good fit for your business. Now you need to decide how you want to divide your time. Don’t think you need to post new updates on each network every day. You don’t! Social media is about quality, not quantity. This is true when it comes to the size of your audience, and is also true when it comes to the amount of content you share. The frequencies listed under each social network in the infographic are suggested frequencies; not requirements for success. Depending on the role each network plays in your social media plans, you may want to adjust these numbers. In addition to these suggested frequencies, you’ll also want to monitor your networks for feedback, and look for opportunities to engage directly with your members. This brings us to the type of content you’ll want to share and when to share it. Once you know which social networks you want to use for your business, the next step is to create a content plan. 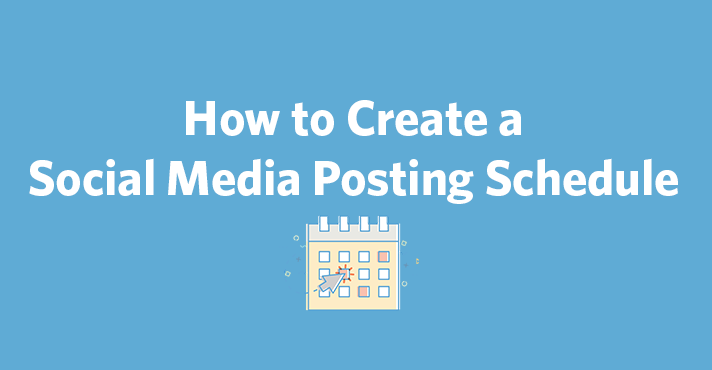 Don’t jam-pack your schedule with promotional posts. Remember that your goal on social media should be to grow relationships and build an audience for your business. It’s not to turn every new fan, follower, and connection into a paying customer. Consider the purpose of each social network and what you want to accomplish by using them. Your small business might choose Facebook as the place to share news, blog posts, and how-to videos to help educate your audience. You might use LinkedIn to establish your expertise and show your company culture. Tip: Try to limit your promotional content to just 20 percent of your weekly posts, with the other 80 percent focused on keeping your audience engaged and informed. Themes can be helpful when creating a content plan. Try Monday Motivation quotes for Mondays, Wednesday Wisdom for tips, or Throwback Thursday for nostalgia and photos of you or your business from a few years back. Create some “evergreen content” that can be recycled on social media throughout the year. Evergreen content is content that won’t go out-of-date and will always be useful to your audience. Use sources like the frequently asked questions from your website, the videos and blog posts that get the most traffic, and tips or best practices to create your evergreen content. You don’t have to create every piece of content yourself. Try sharing curated content — which is valuable content from credible sources that’s relevant to your business and customers — directly on your social networks or share social media posts by curated sources. When you share the latest industry news and trends from a variety of sources, your audience will see you as an authority and come back to you when they need to find information. The best way to figure out what type of content your audience is most interested in is to test. Keep an eye on your key engagement metrics (likes, comments, shares, retweets, clicks, etc). These provide insight into which type of content is working, what’s not, and what you could be doing differently to improve your strategy. In addition to testing different posting frequencies, you can also test different days of the week, and different times of the day. For some businesses, the majority of social media activity will take place during the Monday – Friday, 9 a.m. – 5 p.m. work week. Other businesses may see more engagement on weekends, early morning, or later at night. It all depends on your audience, and when you think people are most likely to see your posts. 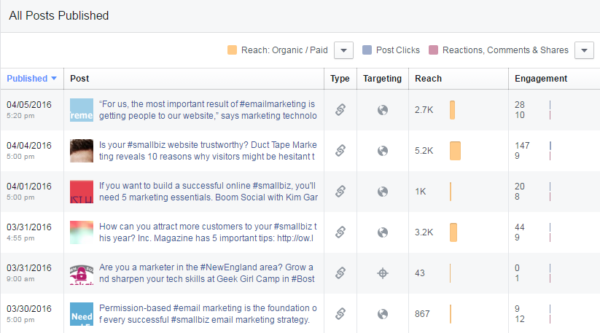 Tip: Here’s how to Find the Best Time and Content to Post on Facebook with Facebook Insights. Now it’s time to pull your schedule together. At first, you may want to focus on your top 1-2 social networks. Once you see how it works with one network, you can start to incorporate all of your activity into your social media schedule. You can recreate this calendar in any word processing software by creating a table, inserting social media images (we recommend downloading this free social media icon set from Dustin W. Stout’s blog), and using color coding to signify which social network you’re posting to, your email marketing schedule, and other news or events happening at your business. Make sure your schedule is supporting the things already going on in your business and that you’re combining your existing marketing — like email marketing — into your schedule. Email marketing programs, like Constant Contact, make it easy extend the reach of your marketing emails by sharing them directly to your social media channels. Find the networks that are right for your business. Learn the type of content that works well on each network. Start with your most important social networks, and add others over time. Find the tools you need to improve social media productivity. Track your results and make adjustments when needed. Your schedule will help you save time and stay organized as you build your presence. It will also improve your chances of following through on your social media plans. Editor’s Note: This post was originally published in February 2014 and has been updated for relevancy.